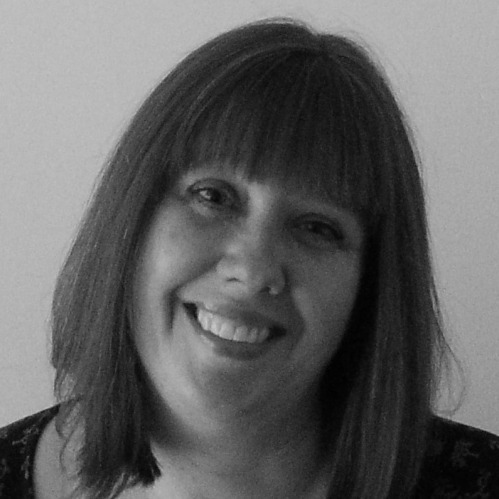 Hello friends, I hope you are all well. Today I have something bright and cute for you. Some critters having a bbq on the beach – I’m sure all koalas and kangaroos love to do that! What could be more fun? Unless you don’t want sand in your sausages! 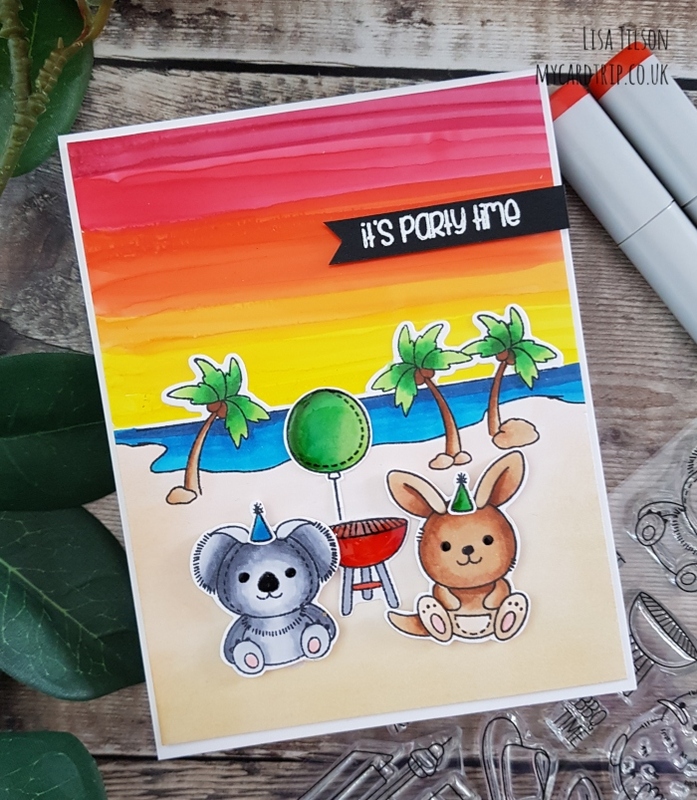 Today’s card features the ever so cute Plushies Down Under – I couldn’t resist another play with this set and I wanted to pair it with the beach scene image from Scene It More. It seemed like a good match to me. 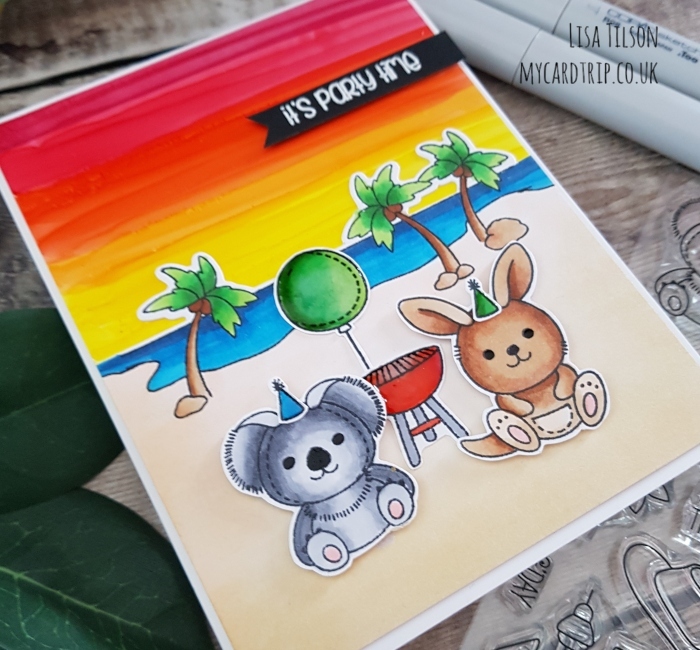 My background was created with Copics on yupo paper, a fun technique I’ve not tried for a while and I went with some Australian sunset colours. This was adhered to a top folding A2 card base with DST. Using the Scene It More coordinating dies, I die cut the palm trees from Neenah 80lb and then put the die cut panel in my MISTI and stamped my image on top. I find it easier to line them up this way. I also stamped the critters, bbq, party hats and balloon at the same time. I coloured the whole scene with Copics (numbers listed below) and this did take a little while. I actually coloured the beach panel twice as I didn’t like my first attempt, I felt it was too dark. For the second attempt, the sand was created with a E00 Copic and then some Antique Linen Distress Ink blended over the top to give it a bit more depth at the sides and bottom. You definitely need your sunglasses on for this card! But it was fun to create. I adhered the scene panel flat onto the base card, the bbq and balloon were also adhered flat but I did pop the critters up with foam tape. I added some sparkle onto the bbq, hats and balloon and then some Tonic Crystal Glaze on top that so they have a lovely shine. I sure hope the balloon doesn’t get too hot and pop whilst the sausages are sizzling haha! I also popped a little bit of black glaze pen onto the koala and kangaroos eyes. The sentiment is from Clearly Besotted’s So Much To Say and this was stamped with Versamark onto black cardstock and white heat embossed. I trimmed it with my SSS Sentiment Label dies and popped it up with foam tape. WOW ! Fantastic idea to think that our wildlife uses the beach too. Great colours, very bright & eye catching & super cute critters. Wonder if they use the park too ? What a stunning card! Love the use of the copics on the Yupo paper – something else I’m going to have to buy!.